Imagine that you’re on a television game show and the host presents you with three closed doors. Behind one of them, sits a sparkling, brand-new Lincoln Continental; behind the other two, are smelly old goats. The host implores you to pick a door, and you select door #1. Then, the host, who is well-aware of what’s going on behind the scenes, opens door #3, revealing one of the goats. This counterintuitive and often-debated problem is discussed in detail at Priceonomics. 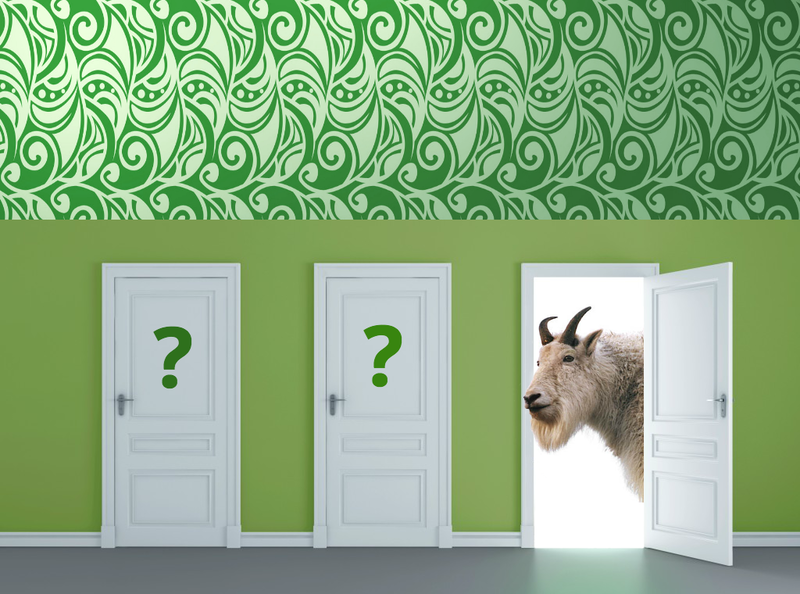 No, the Monty Hall game is different. When Monty opens one if the two doors he knows it is not the winner. Deal or No Deal has the contestant pick which case to open each time, so any of them could be the million dollar case. If Monty opened a door at random then the situation would be like Deal or No Deal. The contestant would be left with a 50/50 chance, and sometimes the Monty would open the winning door. Think again. If the question is whether a briefcase contains a good prize, at the time you originally choose _your_ briefcase, the odds of it containing a good prize are, say, 5 in 30. The odds of the stage briefcases containing a good prize are 25 in 30. If you come down to the end (to the 2-briefcase situation) and there's still a good prize left, the odds that it's the stage briefcase would still be 25 in 30. If it comes down to 2 briefcases at the end it's 50/50 - there's no benefit in switching cases. You might as well select 2 cases at the outset and open all the others. It's the same as the Monty Hall Problem where Monty doesn't know where the car is and just happens to open a door with a goat. In that instance it's 50/50 between your door and the door Monty didn't open. The odds of a good prize being in _one_ of the stage briefcases would be 25 in 30. The odd of the one that remains is the same as the odds for the one you chose first. This is not the same as the Monty Hall game. Imagine two versions of the game, one hosted by Monty and one hosted by Howie. All we care about here is the big prize because we only get to choose to keep the case or switch when there is one case left on the stage. Monty is giving you a choice between the case you chose first or all of the other 29. He opens 28 of them, but if one of them had the million in it, he would skip it. If you make the trade, and one of the 29 cases had the million _any of the 29 cases_, you get the million. Howie is giving you a choice between the case you chose first and one particular other case. If the million is in _that_ case, you win it. If the million is in any of the other cases you don't get far enough to make the choice. Your first choice has a 1:30 chance of having the million. The last case has a 1:30 chance of having the million. There is a 28:30 chance that the million is in one of the other cases. Assuming you get to the last case, both have the same chance of being the million. You pick another case. It has a 1:29 chance. One case left, 1:2, just like your first choice. This is the same as if you chose two cases at first. Both started with a 1:30 chance and nothing changed about them. The only thing that changed is if you get to the end you know one of those cases is the million. You have no better chance with either case. Monty picks case to eliminate. It is not the million. Monty picks another case to eliminate. It is not the million. He does this 26 more times. This is the same as choosing one case or the other 29. The stage case is the winner if any of 29 cases was the winner. You have a much better chance obviously. That was meant as a reply to Lurker111.